After completing our latest YouTube video featuring our new peel & stick backsplash, we got to thinking about how much impact a backsplash can have on a kitchen’s look. Choose a color that doesn’t go with your cabinets, and the whole vibe of your room is skewed- but on the flip side, you may risk a flat look with a hue that matches too much. 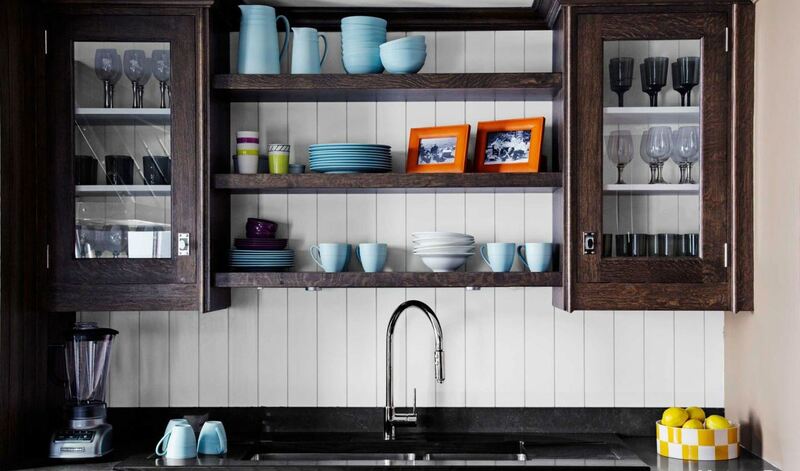 It’s safe to say that backsplashes hold a certain amount of power regarding kitchen decor. Here are ten unique and beautiful backsplashes to serve as inspiration for finding your kitchen’s perfect finishing touch. 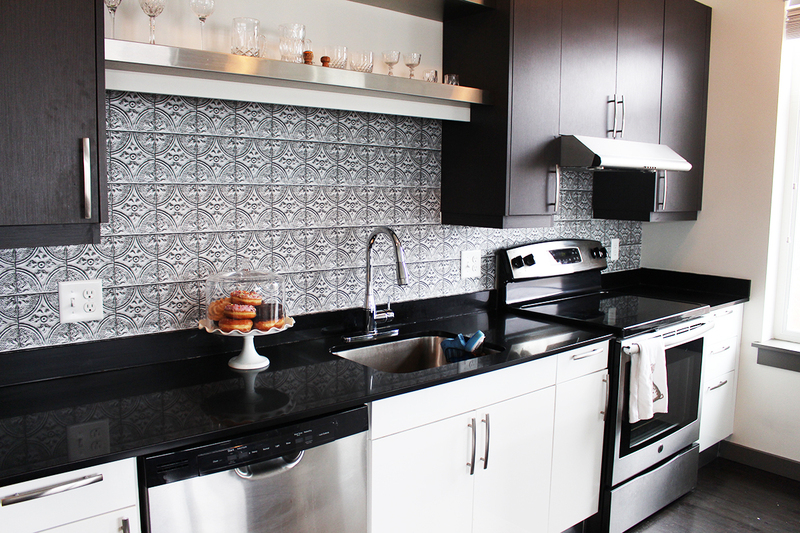 Add an industrial chic look to your kitchen with this detailed tin tile backsplash. The peel & stick material makes installation easier than ever, and means it’s a great solution for renters to instantly transform their space. Plus, a subtle silver sheen adds to its realistic look! Want to see more on this kitchen makeover? Watch the video now! 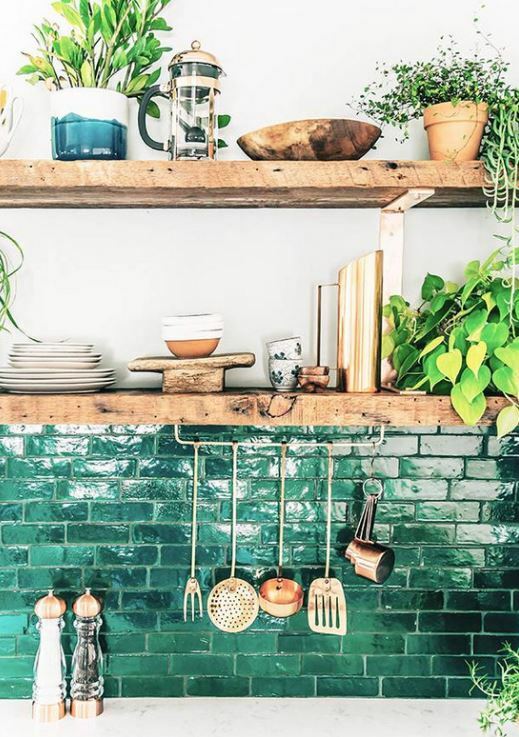 With a stunning emerald hue, this kitchen backsplash is more like jewelry than bricks. Brilliant gem hues are a perfect way to upgrade the clean subway tile look. 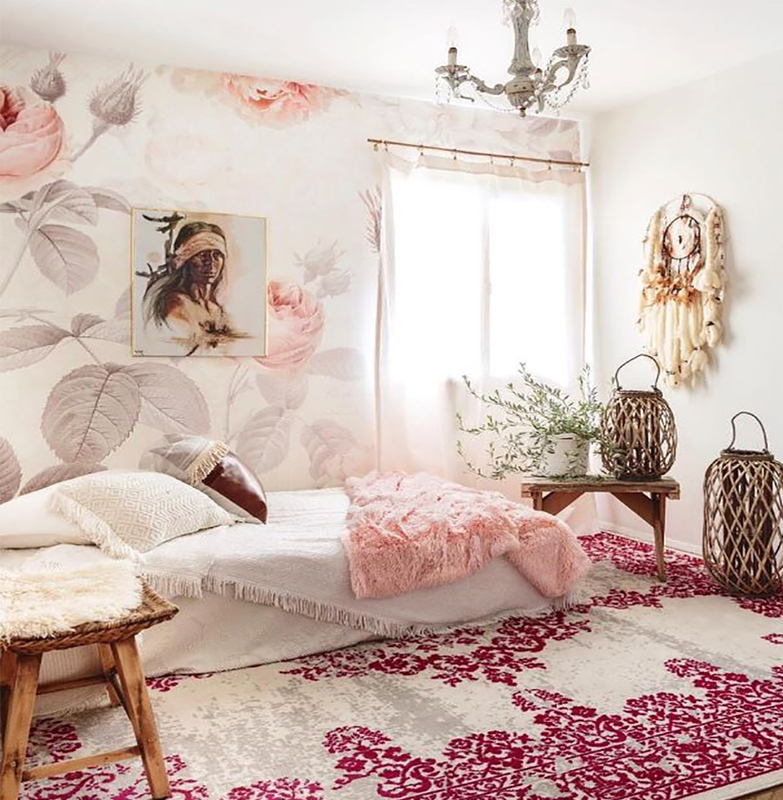 These saturated colors fall perfectly into the current maximalist trend. 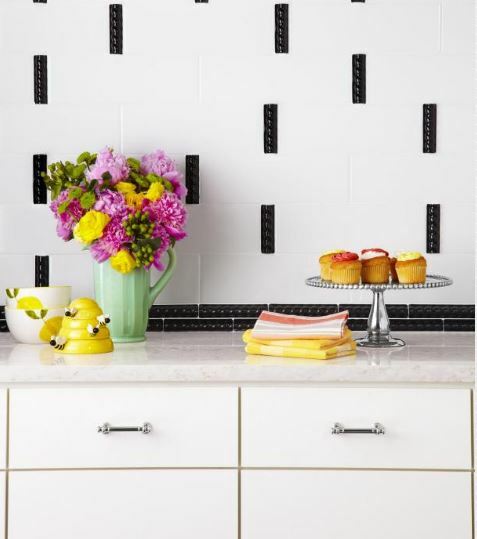 Black and white tiles are a classic pair, but this backsplash turns this traditional combo on its head. The mixture of large horizontal white subway tiles with thin vertical black accent tiles creates a dazzling design with a modern flare. 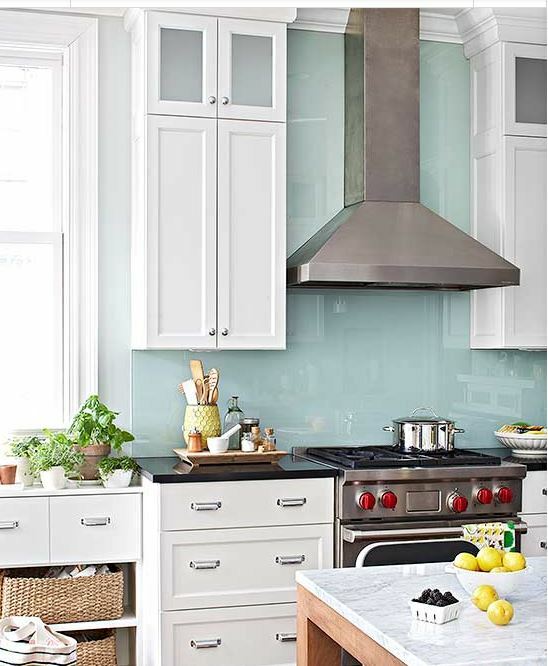 Another fun and chic alternative to tile, this single sheet of glass backsplash has an elevated and clean look. By extending from counter top to ceiling, this modern backsplash effortlessly adds color to the space and poses as the perfect backdrop to the stainless steel hood. Create a warm and inviting kitchen with a brick backsplash. Coming in a variety of hues, this timeless material can fit into almost any kitchen’s color scheme. 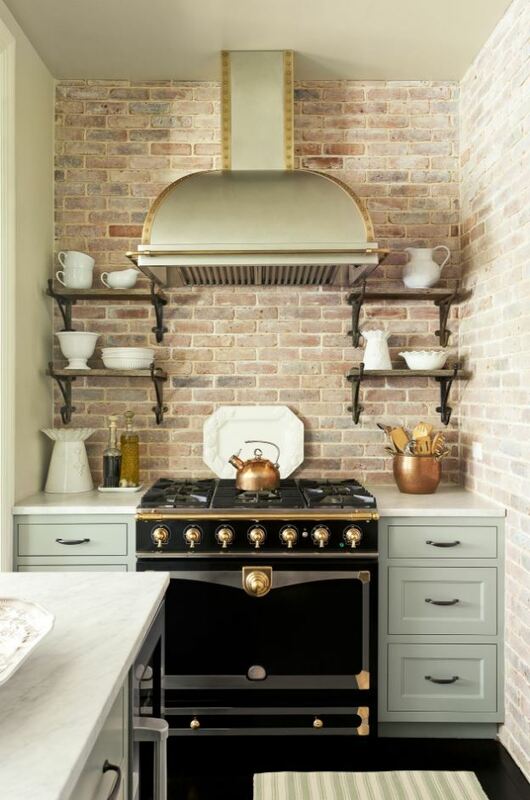 This specific brick backsplash emulates the homey feeling of a crackling, wood-burning stove. Reduce, reuse, recycle! This dazzling terrazzo-styled backsplash features hundreds of shards of recycled glass. 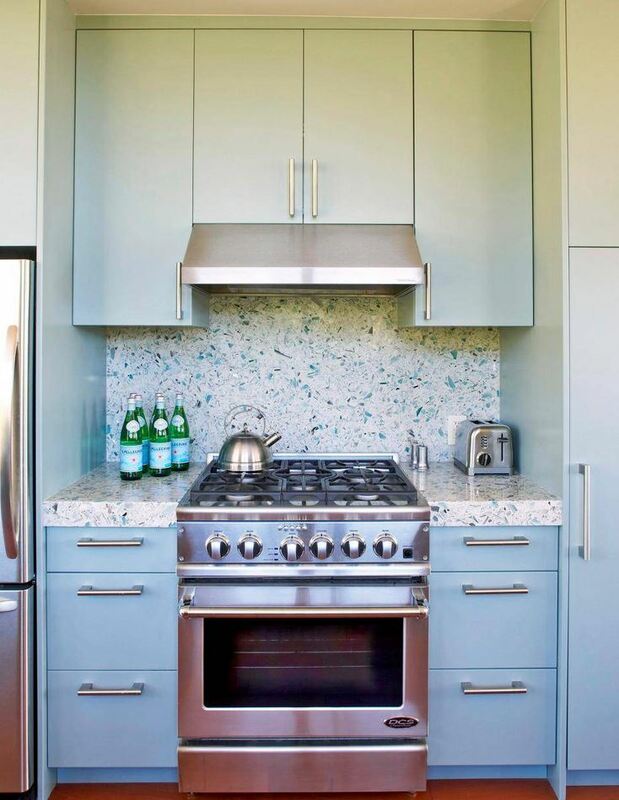 Its icy blue hues complement the cabinets perfectly, while the playful design adds an element of fun. 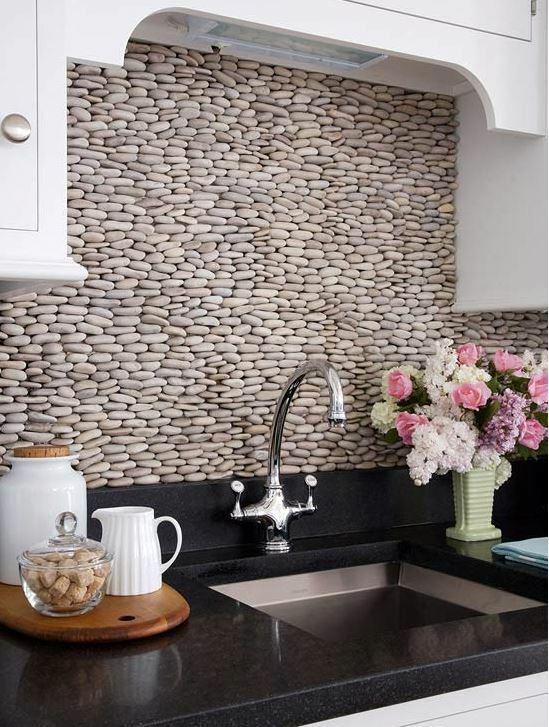 Hundreds of smooth pebbles make up this eye-catching backsplash. By not having grout, this backsplash fits seamlessly into the rest of the kitchen decor. The pebbles’ neutral hues and soothing curves create an elegant design perfect for combining organic and sophisticated styles. Bring a cool and glam feel to your kitchen with a polished metal backsplash. 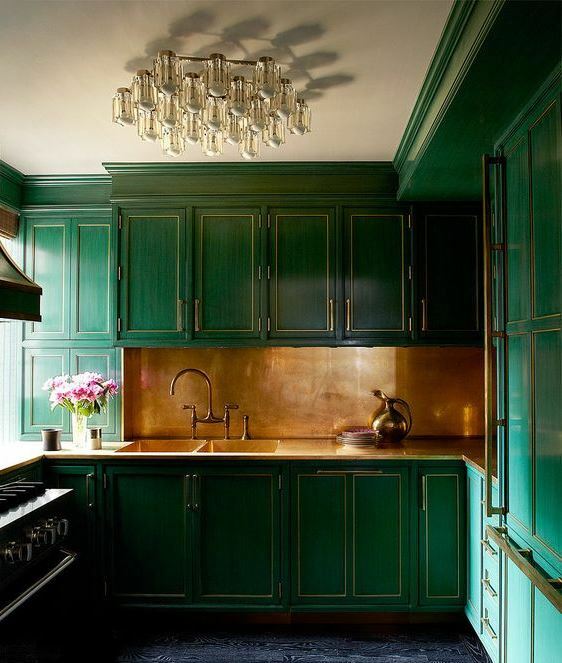 Perfect for creating a bold and chic look, this brass backsplash not only adds a sense of warmth to the room but complements the jewel-toned cabinets as well. Everyone knows black never goes out of style, and that stays true when it comes to kitchen decor. 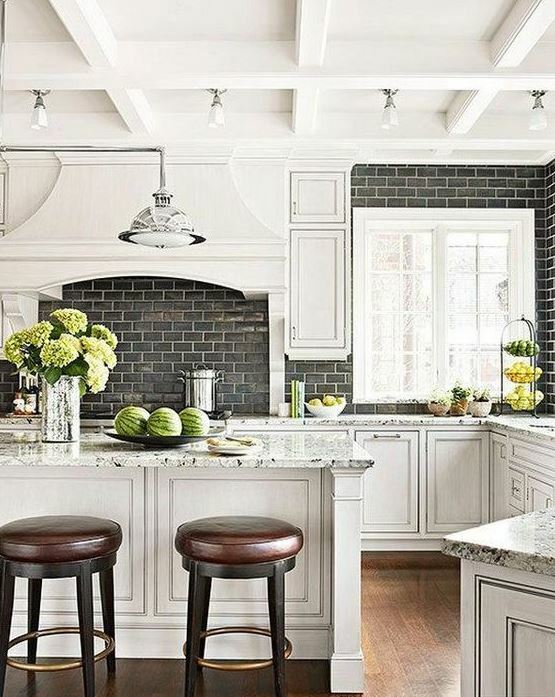 This black subway tile with white grout infuses a bold and sophisticated feel into an otherwise neutral kitchen.